Theresa May has responded to criticism from her own MPs over talks with Jeremy Corbyn by saying all MPs have a responsibility to deliver Brexit. The PM said the public “expect us to reach across this House to find a way through this”. Mr Corbyn said he welcomed the PM’s “willingness to compromise to resolve the Brexit deadlock”. The PM’s move to hold talks has angered some Brexiteers, with two ministers resigning over it. Chris Heaton-Harris became the latest to quit on Wednesday afternoon, claiming his job at the Department for Exiting the European Union had become “irrelevant” if the government is not prepared to leave without a deal. Wales Minister Nigel Adams also resigned his role on Wednesday morning, saying the government was at risk of failing to deliver “the Brexit people voted for”. The PM met Mr Corbyn before holding talks with Scotland’s First Minister Nicola Sturgeon and Welsh First Minister Mark Drakeford. Ms Sturgeon – who met the Labour leader earlier – called for a long extension to work out the way forward and a public vote on any deal. She tweeted that her meeting with Mr Corbyn had been “positive”, adding that she would be “surprised and very disappointed if Labour sold out”. Mr Drakeford has said he wants to argue for a closer long-term economic relationship with the EU. The SNP, Liberal Democrats, Green Party, Plaid Cymru and The Independent Group have also held a joint press conference, calling for any decision made by the leaders to be put to a public vote. Plaid Cymru’s Westminster leader, Liz Saville-Roberts, said: “People have the opportunity to have another shot at it, [in the Commons], to change their mind. The UK has until 12 April to propose a plan to the EU – which must be accepted by the bloc – or it will leave without a deal on that date. In a statement on Tuesday night, the PM announced she wanted to meet Mr Corbyn to agree a way forward and put the plan to a vote in the Commons before 10 April – when the EU will hold an emergency summit on Brexit. She insisted her withdrawal agreement – which was voted down last week – would remain part of the deal. If there is no agreement between the two leaders, Mrs May said a number of options would be put to MPs “to determine which course to pursue”. 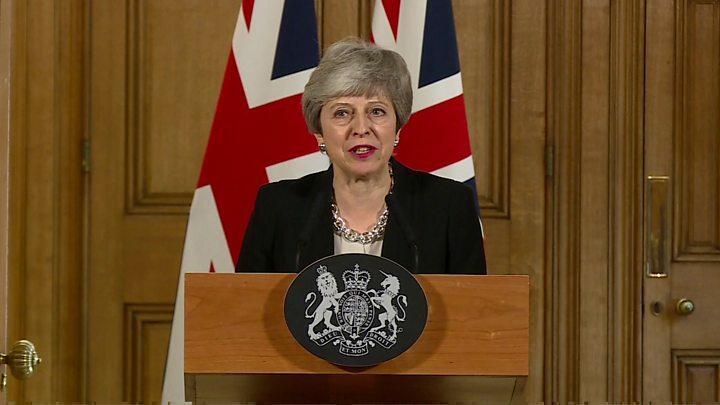 In either event, Mrs May said she would ask the EU for a further short extension to hopefully get an agreement passed by Parliament before 22 May, so the UK does not have to take part in European elections. Brexiteers were quick to express their anger at the prime minister’s move. Prominent Leave supporter and former foreign secretary Boris Johnson accused Mrs May of “entrusting the final handling of Brexit to Labour”. 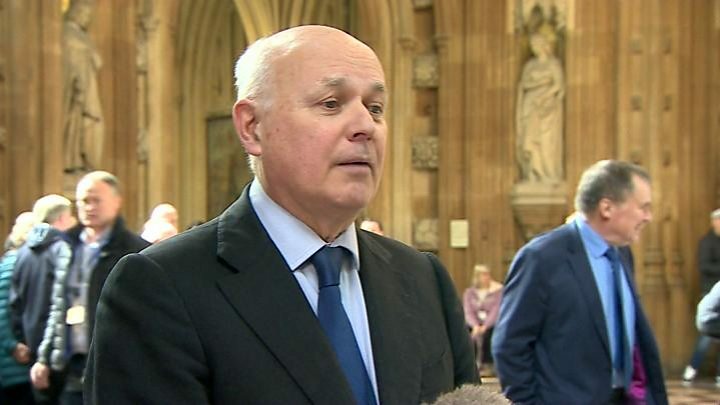 Former Tory leader Iain Duncan Smith told BBC News he was “absolutely appalled”, calling the Labour leader “a Marxist whose sole purpose in life is to do real damage to the country”. The BBC’s Laura Kuenssberg also said she has seen a motion that would censure the prime minister and other government ministers for their handling of Brexit, saying this is a “taster of the anger around”. Mrs May stressed that MPs had “rejected every proposal so far”. And Brexit Secretary Stephen Barclay blamed hard Brexiteers in the pro-Leave European Research Group for making the PM move this way. He told BBC Radio 4’s Today programme the alternative to the PM’s deal was to seek votes from the opposition benches “because 35 of my own colleagues would not support the prime minister’s deal”. And he warned that consequence of MPs not passing the PM’s deal was either a “soft Brexit or no Brexit at all”. Mrs May told MPs there were a “number of areas” where she agreed with Mr Corbyn in relation to Brexit, including ending free movement. The Irish Taoiseach Leo Varadkar said the talks were “timely”, and he hoped Mr Corbyn would “rise to the occasion” and “come up with a compromise plan” with the prime minister. What is the PM offering to change? Theresa May announced on Tuesday that she wanted to hold talks with Jeremy Corbyn on a way forward for Brexit. But she made it clear in her statement that one element of her deal would not change. The PM’s negotiated plan includes two sections – the withdrawal agreement and the political declaration. The withdrawal agreement sets out how the UK would leave the EU, including the money the UK must pay to the EU as a settlement, details of the transition period, and citizens’ rights – as well as the controversial Irish backstop that aims to avoid a hard border on the island of Ireland. The political declaration focuses on the future relationship with the bloc and, unlike the withdrawal agreement, is not legally binding. Mrs May said on Tuesday that any plan she agreed with Mr Corbyn “would have to agree the current withdrawal agreement”, but she was ready to discuss the future relationship, i.e. the political declaration. Brexit Secretary Stephen Barclay also said that was the element Labour had expressed more concern about. The BBC’s Laura Kuenssberg said there was not much difference between the government’s version of Brexit and Labour’s version – but there did not seem to be “an enormous amount of confidence” a political consensus could be reached from either party. The row comes after Mrs May had more than seven hours of talks with her cabinet on Tuesday. Laura Kuenssberg said there was “rage and dispute” in the cabinet meeting, with “wildly varying accounts” of how many people were for and against different versions of Brexit extensions. Labour has previously said it has five demand for supporting a Brexit deal, including protecting workers’ rights and national security, and securing the same benefits of being in the single market the UK has currently. Meanwhile, a cross-party group of MPs will attempt to push through legislation to stop a no-deal Brexit. If passed into law, the bill – presented by Labour MP Yvette Cooper – would require the PM to ask for an extension of Article 50. The SNP, Lib Dems, Plaid Cymru, Greens and the Independent Group are putting forward an amendment to the bill to again call for a public vote on any outcome to become law.